= Kotoshi wa itsu yuki ga furihajimeru no kanaa. = I wonder when it starts to snow this year. Hi everyone! 元気？( = Genki?) How are you doing? Are we ready to study Japanese? Good!!! Today we have a guest teacher, Tipou-Sensei. He is from Canada. He was also recruited to be an angel this year, so we are now good buddies in Dog Heaven. Tipou-Sensei, 今日のレッスン、よろしく！ ( = Kyou ino ressun yosorhiku!) Please take care of today’s lesson. みなさん、はじめまして！( = Minasan, Hajimemashite!) Nice to meet to you, everyone! My name is Tipou. I am a male toy poodle from Canada. My big sister named me Tipou (“little flea” in Canadian French) because I’m cute and small — like a flea! I was raised by a French Canadian family, so I used to only speak English and French. Then I met Maggie Sensei, and ever since, she has been teaching me Japanese! I would love to practice by teaching Japanese here. So be good! = Saa, kyou no ressun wo hajimemashou! = Let’s start the lesson for today. Verb + だす ＊ ( = dasu), 始める ( = hajimeru) and かける ( = kakeru). 1) Generally speaking, you use V+ 始める ( = hajimeru) when things start to happen or you start to do something　gradually. We focus on the beginning on the action and how it continues. And you use V+ だす ( = dasu) when things happen suddenly / when someone starts to do something suddenly /spontaneously and you can’t control it. V+ だす ( = dasu) usually involves sudden or unexpected actions or changes and we use it when we just focus on the beginning of the action. Compared to V+ 始める ( = hajimeru) it is more objective. So you don’t usually use it for our own action unless you describe your own actions objectively. = Basu ga ugoki hajimeta. = The bus has stated to move. They both mean the same “The bus has started to move” but there is the following difference. The bus starts to move gradually in order to go somewhere. The bus started to move suddenly/unexpectedly. = A baby starts to walk. You see that action as the first process of growing up. = Akachan ga aruki dasu. = A baby starts to walk suddenly. You are just focusing on that moment. = Sangatsu nakaba ni sakura no hana ga sakihajimeru. = The cherry blossoms start to bloom in the middle of March. You can use 咲きだす ( = sakidasu) if all the flowers burst into blossom suddenly. = Issei ni hana ga sakidasu. = All the flowers start to bloom suddenly. = Kanojo wa utsukushii koe de utai hajimeta. = She started to sing with a beautiful voice. You were expecting that she would sing a song. = Chikatetsu no naka de kyuu ni hitori no dansei ga utai dashita. = One guy (has) started to sing all of a sudden on the subway. I will show you how to use each verb with more example sentences. = Kusurui wo nondara netsu ga sagari hajimeta. = After I took medicine, the fever started to drop. = Kare wa jibun no oitachi ni tsuite hanashi hajimeta. = He started to talk about his personal history. 2) When you start doing something intentionally. = Sorosoro nengajou wo kakihajimeyou kanaa. = I guess I should start writing New Year’s cards now. = Touan ni kotae wo kakihajimete kudasai . = Please start to write your answers on the answer sheet. = Monku bakari itte inai de hayaku shigoto wo yarihajimetara dou nano? = Stop complaining and why don’t you just start to do your work? 3) When you start doing some on-going activity as a process. = Shigatsu kara atarashii gakkou ni kayoi hajimeru. = I will start to go to the new school in April. = He started to go to the gym out of the blue. = Kare to itsu kara tsukiai hajimeta no? = When did you start to go out with him? 1) When you suddenly / spontaneously begin doing something / when something suddenly happens. = Furasshu mobu de totsuzen, mawari no hitotachi ga odori dashita. = All of a sudden, people around me started to dance in a “flash mob”. = Kare ga kyuuni wakareyou to iidashite kitano. Doushitara ii? = My boyfriend suddenly said he wanted to break up. What should I do? = Ikinari kasai keihouki ga naridashita. = All of a sudden the fire alarm started beeping. = Kare wa sorega joudan dato wakaru to kyuuni waraidashita. = After he realized it was a joke, he burst into laughter. = Akachan wa watashi no kao wo miru to nakidashita. = The baby burst into tears when she saw my face. = Once my younger brother loses his temper, he becomes uncontrollable. = Hoteru wo deta tokoro de kyuuni ame ga furidashita. = It started to rain when we left the hotel. V + だしたらとまらない ( = dashitara tomaranai) = once you do something, you can’t stop doing it. = Ano seerusuman wa shaberi dashitara tomaranai. = Once that sales person starts talking, he can’t stop talking. = Kono sunakku gashi wa oishikute tabedashitara tomaranai. = This snack is so delicious that once I start eating it I can’t stop. You use V + かける ( = kakeru) when you don’t finish what you have started and leave it undone. = Hon wo yomikaketara suguni nemuku natte nete shimatta. = As soon as I started to read a book, I felt sleepy and fell asleep. = Yuushoku wo tabekaketa tokoro ni、 tomodachi kara denwa ga kakatte kita. = When I started to eat dinner, I got a phone call from my friend. = Ichido kawa de obore kaketa koto ga aru. = I once almost drowned in the river. = Kanojo ni tegami wo kakikaketaga douyatte kimochi wo tsutaetara ii ka wakaranakunatta. = I started to write a letter to her but I ended up not knowing how to express my feelings towards her. = Kare no koto ga suki to iikakete yameta. = I was about to tell him “I love you” but stopped in mid-sentence. 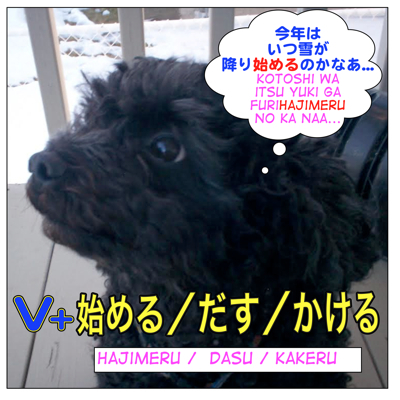 Note: There are certain cases that you use V + かける ( = kakeru) when you begin doing something. In this case it doesn’t imply something is unfinished and left it undone. = Dandan kare no kimochi ga wakari kakete kita. = Thank you, Tipou sensei! = Watashi mo tsukurikake no ressun wo ippai nokoshite tengoku ni kimashita ga, kouyatte mata sutekina nakama to issho ni ressun wo tsukuru koto ga dekite ureshii desu. = I came to heaven leaving many unfinished lessons, but I am happy because I get to make lessons again with wonderful friends like this. Tipou’s sister has translated this lesson in French. Go check this Facebook page. OK, the literal meaning is “has started to go back to the world of sleep” which means the person is falling asleep. I want to ask how to use masu stem + no. Is it the same as ‘刃が折れた剣’? Is there a rule how to use ? 刃折れの剣 is a literal expression. For instence: 引き出す – to pull out. That’s how you figure out the meaning of compound words. Maggie, I need your help to verify the difference between ～終わる and ～終える. Using a few Japanese web sites I’ve tried to figure out it by myself. I came to follow conclusions. ～終える implies that because of certain circumstances the speaker was (in a way) forced to finish a certain action. It can also imply, that the finishing of the action was connected with efforts or that the speaker had no other choice, but to finish his action faster then expected (then it normally would take). ～終わる implies that finishing of the action was a result of normal course of things, because with the passage of time every action reaches its final stage. すしを食べ終わった => implies that the speaker ate his sushi as a normal course of things. He was hungry, ate his sushi and now he’s full. すしを食べ終えた => implies that the speaker had to do some extra actions (it wasn’t just a normal course of things) to finish his sushi. It might imply he did some efforts (for example although he was full he forced himself to eat everything what was on his plate) or he was in hurry and had to finished eating faster then normal, because his bus leaves soon. One of your comment was in the pending file but all other comments worked. I deleted two of them. Will answer this question in Maggie’s room. I noticed you can not post a comment there sometime. If that happens, you can post a question anywhere. First, I have a lesson on ~合う. Other than 合う, there are not so many compound words. It will be easier for you to separate two parts and figure out the meaning. 抱きしめる→抱く(to hold)/ 抱いて(hold and ) ＋締める(tighten ) →抱きしめる= to hold someone/something tightly. 舞い落ちる→舞う(to dance) 舞って(dance and) ＋落ちる( fall) →舞い落ちる = something falls as if dancing. I wanna asking for you..!! What do you mean “this book”? All the lessons here on Maggie Sensei’s site are original. I made the whole thing. How are you? I hope you are fine and everything is ok. This lesson is very useful, I didn’t know how to use these verbs before. Now it’s getting easier. 1. 夕食を食べかけたところに、友達から電話がかかってきた/ ホテルを出たところで急に雨が降りだした。Can you please tell me what is “ところに and ところで” and how to use it? 2. 地下鉄の中で急に一人の男性が歌いだした。 What is “一人の男”? is there any replacement for it? 3. 文句ばかり言っていないで早く仕事をやり始めたらどうなの？ What is “言っていないで” ? Please explain about this form. Why not “言わないで”？I’m confused. こんにちは、kuroineko! Thank you! I am good! How about you? the difference between ところに and ところで is complicated and it is difficult to explain the whole difference here so I will just explain shortly. If you want to learn more about the difference between に and で、go check this lesson. 3. You can also say 言わないで (without complaining) but when you describe someone is constantly complaining, ~ている is better. i tried to translate a song the other day but when i checked the translation online there were two quite different translations and I’m not sure I understand well which is the right one or how the grammar works.Please help! 1)Our breakup, not as dramatic as expected, concluded with a nonchalant bye-bye. 1)While there are many reasons for our parting, the number of the umbrellas represents the number of my sighs. 2)The reasons for breaking up　Were so numerous Just like the number of umbrellas blooming like flowers　I heaved a sigh. 1)At dusk, I let myself dissolve into the waves of people from the Kurume Station. Not going home, I think about the previous night with a racy heart on the street. 1)You made a promise in the end, so please take her to Chinatown. Which I missed the chance to say　No, that’s not it　This is the weakness of a stained woman. 1)Although he’d always be late for our dates, I always wait there first and stay there until it’s become too cold to bear. 1)Instead of my prescribed medicine, I want some tobacco. Will it sedate me? 2)Cigarettes　Given in place of a prescription　Will they still be effective after they burn out? I think 2) translation better.1) doesn’t make sense here and there. I finally understand ‘kakeru’!!! Thanks so much!! Thanks for another great lesson! I stumbled upon this website a few months ago and I’m really glad you’ve gone over the uses ’言う’ and some of the ways of using ’かける’; you’ve helped may it much easier for me to understand them-they seem to be used everywhere! To be honest if there were 2 verbs I could get rid of in Japanese- it would still have to be them.haha! Thanks again and I hope you keep making lessons! I really respect all of you who are trying to learn Japanese. You may hate some of the complicated grammar but I believe you will be able to use them without thinking.